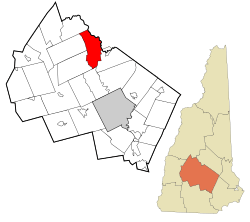 Motto: "The Three Rivers City"
Location within Merrimack County, and the state of New Hampshire. Franklin is a city in Merrimack County, New Hampshire, United States. At the 2010 census, the population was 8,477, the lowest of any of New Hampshire's 13 cities. Franklin includes the village of West Franklin. Situated at the confluence of the Pemigewasset and Winnipesaukee rivers that form the Merrimack River, the town was settled by Anglo-European colonists in 1764 and originally known as Pemigewasset Village. It was taken from portions of Salisbury, Andover, Sanbornton and Northfield. The name Franklin was adopted in 1820 in honor of statesman and founding father Benjamin Franklin. Water power from the falls helped it develop as a mill town. It would incorporate as a town in 1828, and then as a city in 1895. Daniel Webster was born in a section of Franklin that was then part of Salisbury. There is a state historic site located off Route 127 that preserves the famous orator's childhood home. As an adult, Webster owned "The Elms", a farm near the Merrimack River along present-day Route 3. In 1943, the Army Corps of Engineers created the Franklin Falls Reservoir above Franklin by constructing the Franklin Falls Dam for flood control on the Pemigewasset River. Franklin is located at (43.446956, -71.656966). According to the United States Census Bureau, the city has a total area of 29.1 square miles (75.4 km2), of which 27.3 square miles (70.7 km2) is land and 1.9 square miles (4.9 km2) is water, comprising 6.31% of the town. It is drained by the Winnipesaukee, Pemigewasset and Merrimack rivers. Webster Lake is in the north. The highest point in Franklin is an unnamed summit near the northwestern corner of the city limits, where the elevation reaches approximately 1,370 feet (420 m) above sea level. Franklin lies fully within the Merrimack River watershed. U.S. Route 3 and New Hampshire Route 11 form Central Street, the main street of Franklin. Heading east, the two routes lead to Tilton and Laconia, New Hampshire. US 3 leads south to Boscawen and Concord, while NH 11 goes west to Andover and New London. 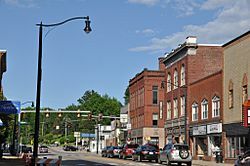 New Hampshire Route 127 also passes through downtown Franklin, leading southwest to Salisbury and Contoocook, and north into Sanbornton. New Hampshire Route 3A leads north from West Franklin to Bristol. As of the census of 2000, there were 8,405 people, 3,319 households, and 2,193 families residing in the city. The population density was 304.9 people per square mile (117.7/km²). There were 3,676 housing units at an average density of 133.4 per square mile (51.5/km²). The racial makeup of the city was 97.10% White, 0.38% African American, 0.27% Native American, 0.51% Asian, 0.01% Pacific Islander, 0.35% from other races, and 1.38% from two or more races. Hispanic or Latino of any race were 1.19% of the population. There were 3,319 households out of which 32.3% had children under the age of 18 living with them, 46.3% were married couples living together, 14.2% had a female householder with no husband present, and 33.9% were non-families. 27.0% of all households were made up of individuals and 10.7% had someone living alone who was 65 years of age or older. The average household size was 2.47 and the average family size was 2.95. In the city, the population was spread out with 25.8% under the age of 18, 8.5% from 18 to 24, 28.4% from 25 to 44, 22.7% from 45 to 64, and 14.7% who were 65 years of age or older. The median age was 37 years. For every 100 females there were 94.1 males. For every 100 females age 18 and over, there were 87.5 males. The median income for a household in the city was $34,613, and the median income for a family was $41,698. Males had a median income of $32,318 versus $25,062 for females. The per capita income for the city was $17,155. About 8.9% of families and 12.9% of the population were below the poverty line, including 18.2% of those under age 18 and 9.7% of those age 65 or over. 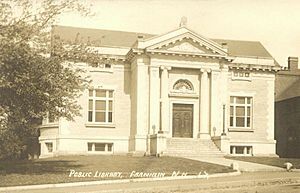 Franklin, New Hampshire Facts for Kids. Kiddle Encyclopedia.